CORVALLIS, Ore. – New research shows that honey bees prioritize the nutritional status of larvae when selecting for a new emergency queen. This is the first study that has thoroughly investigated the role of nutritional state of larvae in their selection for queen rearing, said lead author Ramesh Sagili, associate professor of apiculture and honeybee Extension specialist in OSU’s College of Agricultural Sciences. Honey bee colony fitness is dependent on queens, so their production is a vital task. If the current queen dies, emergency queens must be reared. Worker bees then select few larvae from the existing pool to raise new queens. The colony only has about six days after the last egg was laid to begin rearing new queens. Poor queen quality has been one of the top concerns of the beekeeping industry in the United States for the past decade. Each year approximately 1.5 million honey bee queens are reared and sold to beekeepers in the United States. They established observation hives in which they artificially deprived one group of larvae of brood food – known as royal jelly – while allowing the other group to be fed, and then measured nurse bee responses to those larvae. They also compared two queen-rearing methods – grafting and natural. For each method, they created groups of deprived and non-deprived larvae, placed them in experimental colonies experiencing emergency queen-rearing conditions and then measured how many queens were reared to pupation from each treatment group. 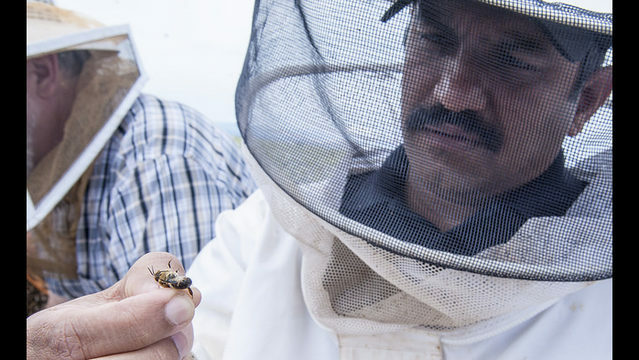 “The bees were still selecting larvae for queen rearing mainly based on deprived and non-deprived nutritional states,” said Sagili, who helped create the Oregon Master Beekeeper Program in 2010 and chaired the Governor’s Task Force on Pollinator Health in 2014. Study co-authors are Hannah Lucas, Priyadarshini Chakrabarti and Carolyn Breece – all researchers at OSU’s Honey Bee Lab – and Brad Metz at N.C. State’s Honey Bee Queen and Disease Clinic.